I love decorating for each holiday, especially because it gives me a reason to be crafty. 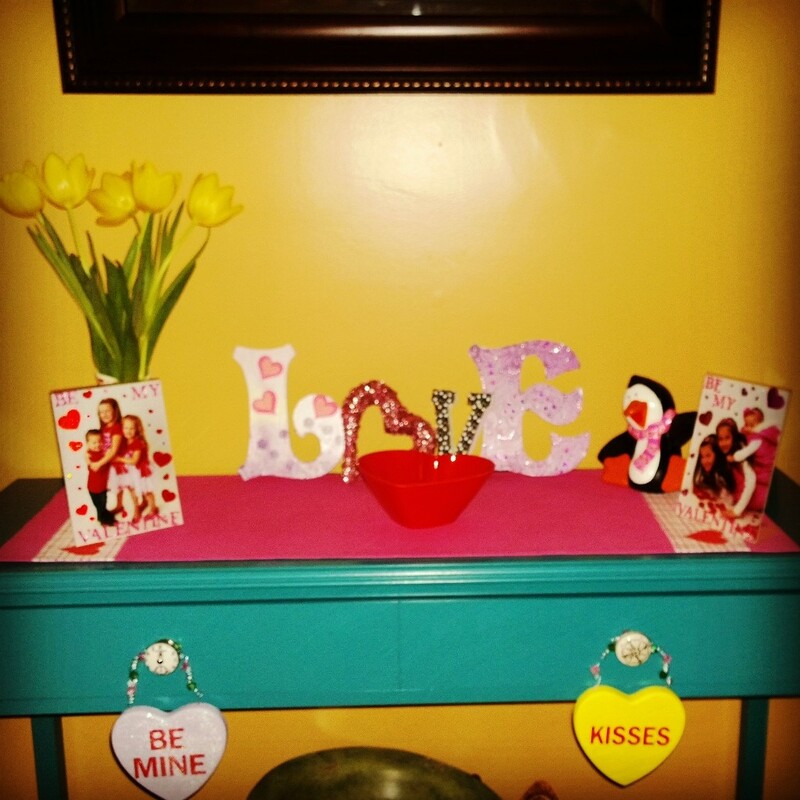 The love letters are the easiest Valentine’s Day decorations you could possibly make. They are very similar to the Noel letters I made for Christmas. Here, I used a sequence heart for the O in LOVE, and Mod Podged scrap book paper to the other letters. 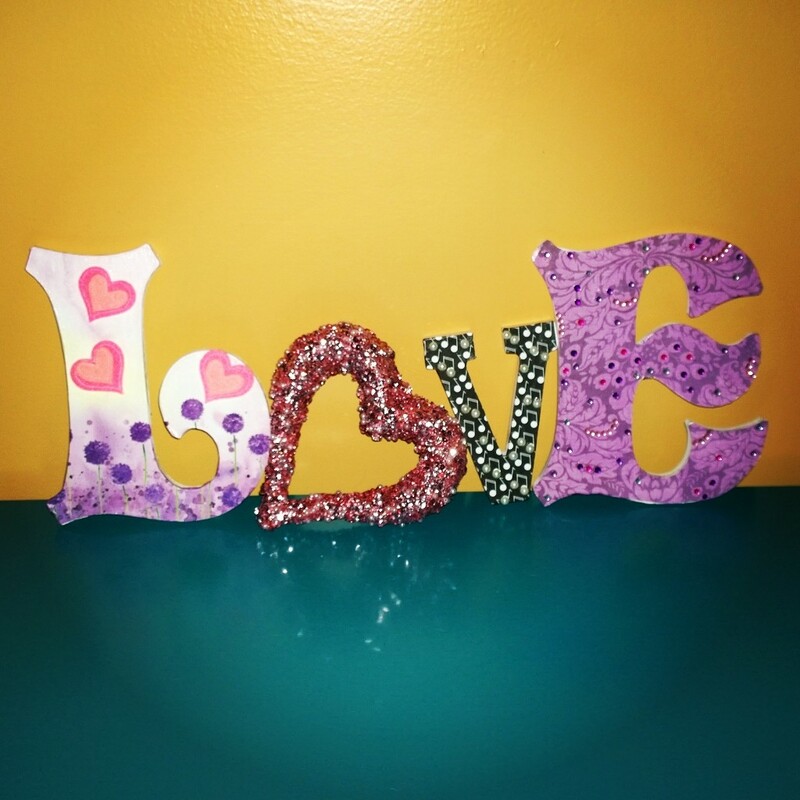 I also added some embellishments to the letter: felt hearts on the L, “pearl” beads on the music notes of the V, and purple and pink rhinestones on the E. I also used different sized letters for a whimsical look. 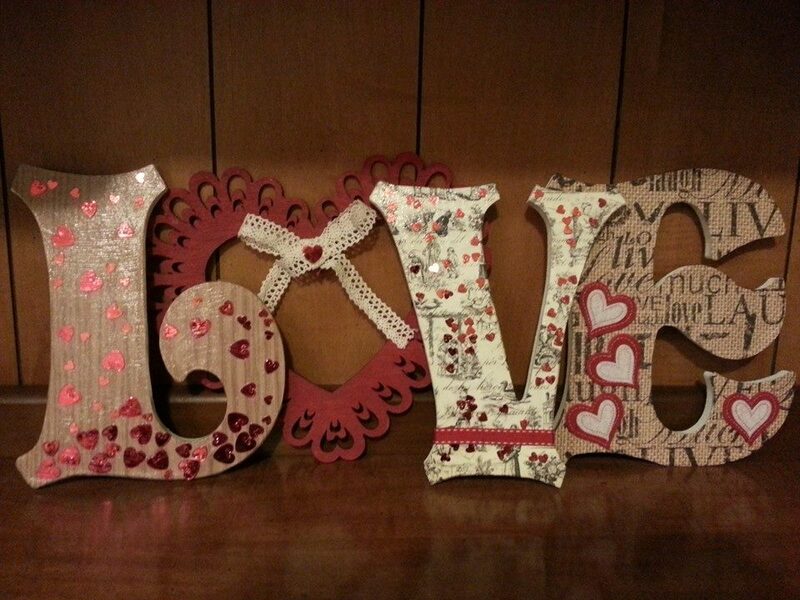 Most of my Valentine decor is pink and purple, but my friend Sara made her letters in more neutral colors with red accents. Same idea with a totally different look! 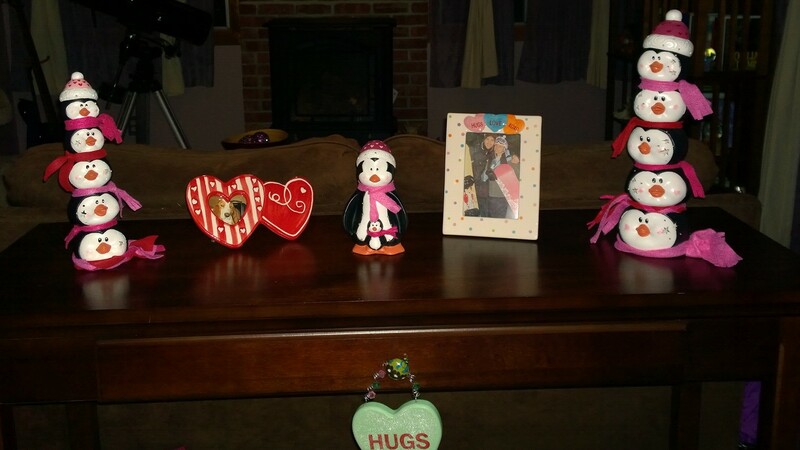 I put my “L-O-V-E” at my entryway table with pictures of my adorable Valentines, my nieces and nephew. I’m also on a penguin kick. I just painted some ceramic penguins and decided they are my new, unofficial mascots of Valentine’s day. How could you look at adorable penguins and not feel love? I’m not an overly mushy, romantic person, but I do love Valentine’s Day.I think the idea of celebrating love is a wonderful thing. Many people don’t like Valentine’s Day because it can be superficial, materialistic, cliche, just a reason to spend money, all of the above. But I think we should look at Valentine’s day a bit differently. I know Valentine’s Day is a couples holiday, and I’ll certainly be spending it with my Cheese, but even before then when I didn’t have a boyfriend I’d find ways to celebrate. My Dad would always give me a card and me and my friends would buy each other chocolates. Last year my friend Meg and I hosted a root beer float social at work with pretty heart straws and paper goods. I’ll bring in some cupcakes this year. I’ll probably pick up some special treats for my pets and some flowers for my Mama. There are all different kinds of love, and maybe if we focused less on “romance” (and the commercialism attached to it) and more on real, actual LOVE, people would appreciate Valentine’s Day more. Be sure to show the people in your life how much you love them, that goes for your significant other and your friends, family pets, and anyone else lucky enough to have your love.